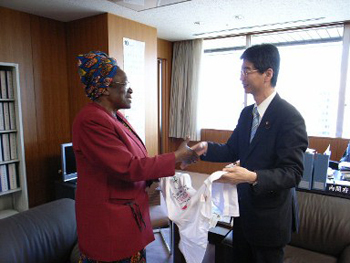 Prof. Miriam K. Were, the Laureate of the first Hideyo Noguchi Africa Prize (Medical Services Category) in 2008 visited Japan to participate inSTS Forum( Science and Technology in Society Forum) and encourage the victims of the great east Japan earthquake in Fukushima. STS Forum was held in Kyoto from October 2 to 4. 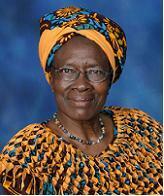 She had a lecture “CONTROL OF INFECTIOUS DISEASES & OTHER COMMUNICABLE DISEASES THROUGH THE COMMUNITY HEALTH STRATEGY”. During the presentation, she emphasized the community health approach appropriate for Africa’s development needs: In most sub- Sahara African countries, the majority of the people lives in communities far away from health facilities and many people suffer from infectious diseases. Bringing health to the community improves access for all to health care. Through the community health strategy, the people can be integrated into the formal health system. This provides plenty of opportunities to control infectious and other communicable diseases in sub-Sahara Africa. Then, she visited Fukushima prefecture on October 5 and 6. 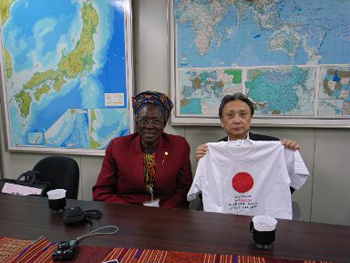 During her visit, she visited places related to Dr. Hideyo Noguchi and areas hit by the great east Japan earthquake. 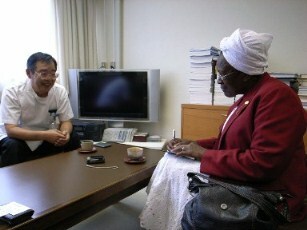 Her great career as a doctor and her warm personality (well-known as “Mama Miriam” or “Big mama”) encouraged victims and volunteers in Fukushima. 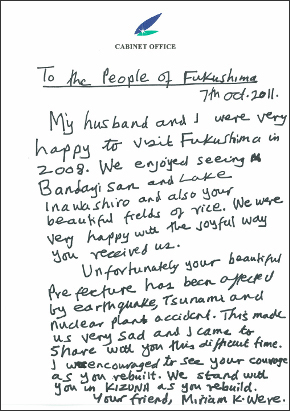 My husband and I were very happy to visit Fukushima in 2008. We enjoyed seeing Bandai san and Lake Inawashiro and also your beautiful fields of rice. We were very happy with the joyful way you received us. Unfortunately your beautiful prefecture has been affected by earthquake, tsunami and nuclear plant accident. This made us very sad and I came to share with you this difficult time. I was encouraged to see your courage as you rebuild. We stand with you in KIZUNA as you rebuilt. Your friend, Miriam K. Were. Prof. Were is spreading MCH Handbook. Important pillar of community health strategy in Kenya. It refers to Japanese MCH Handbook system. Prof. 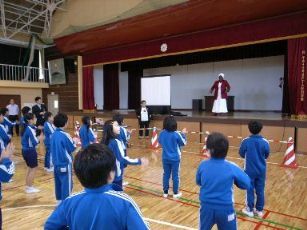 Were gave a lecture on African culture to children of Nakamura Daiichi Elementary School. 1. Could you tell us why you came to Japan this time ? There are two reasons I came to Japan. One reason is to participate at STS (Science and Technology in Society) Forum that was held from October 2nd to 4th in Kyoto, chaired by Mr. Koji Omi, ex-Minister of Finance.I was invited by the Forum to give a lecture on infectious diseases. Another one was to visit Fukushima. I have been having an idea to visit Fukushima again since the Great East Japan Earthquake in last March. I was very sad and sorry. I decided to go to Fukushima, because I thought the invitation by STS forum was a good opportunity. 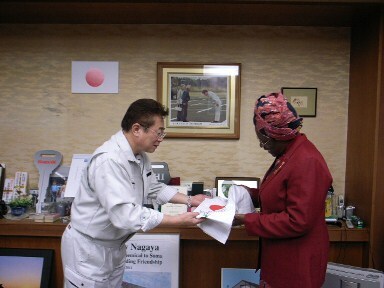 When my husband I and colleagues visited Fukushima in 2008 after the Prize ceremony, we were very happy with the joyful way people received us. I feel Fukushima is my home. I placed a bouquet of flowers in the sea in the memory of those who lost their lives and those who have not yet been found. I also visited temporary houses where displaced families live and I was very happy they were laughing with me. 2. Have you had any changes after receiving the Hideyo Noguchi Africa Prize? 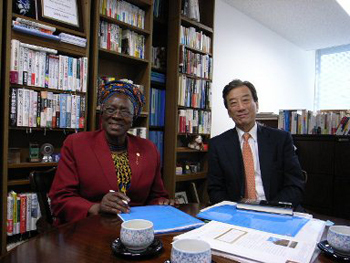 Though Dr. Noguchi worked not only in Africa, but also in the U.S., Latin America and Europe, etc..., I was very happy that Japanese Government honored Africa and created the Noguchi Hideyo “Africa” Prize. It is encouraging not only for some African people who could be candidates for this Prize but also for all Africans. TICAD (Tokyo International Conference on African Development) with all African leaders gathering enriches and encourages Africa. In the world, some people say “Hopeless Africa”. However, the phrase “Towards a Vibrant Africa” was written in the brochure of TICAD Ⅳ in 2008. This phrase is very encouraging for Africans. Moreover, the strong point for the Noguchi Hideyo Africa Prize is its prize money (“One hundred million yen”). This Prize money helped us to support training of public health workers who deploy their activities in communities, to provide a vocational training and medical services, to improve the access to general health care. Before, AIDS orphans, having lost confidence, were scared because they didn’t understand what to do. Some of them suffered from sexual abuse or prostituted themselves. But, they could regain their confidence through training to become kindergarten teachers. 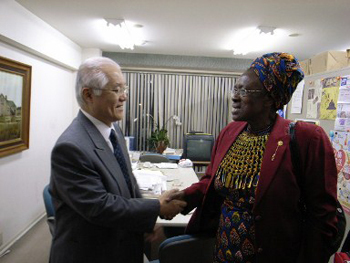 The Noguchi Hideyo Africa Prize made it possible to assist some of them. I am very happy about that. I would like to continue and develop such a movement at the community level. 3. You are interested in mother and child health handbook (MCH HANDBOOK) . Representatives from Kenya, Uganda, Tanzania, Burundi and Malawi gathered and held a workshop on MCH Handbook in March 2010 in Nairobi. People asked us, on the occasion of the 7th international conference on MCH Handbook in Bangladesh 2010, to host the 8th international conference in Kenya in 2012. And I accepted. This will be the first trial for Africa. Though Africa is the most behind achieving the targets 4 and 5 of MDGs, this will be a chance to push forward the momentum in Africa towards achieving MDG 4 & 5. 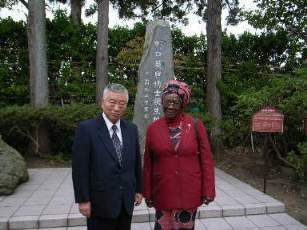 On that occasion, I hope we will organize an event related to the Noguchi Hideyo Africa Prize to celebrate the 4th anniversary of the Prize. Address: 1-11-39 Nagata-cho, Chiyoda-ku, Tokyo 100-0014, Japan.